An award-winning journalist delves behind the scenes of a chilling true crime story aired on TV's 48 Hours Mystery -- and uncovers twisting revelations inside an already shattering case of double homicide. Halloween night in idyllic Napa, California: two young women roommates -- a transplanted Southern beauty queen and a popular engineering graduate from the Napa area -- are brutally stabbed by an intruder who entered their home through a first-floor window. A third roommate heard the horrific commotion but never saw the killer. News of the tragedy sent shockwaves throughout the peaceful region as well as the nation -- but while investigators pursued every angle from a satanic cult to a disgruntled suitor, the murders of Leslie Mazzara and Adriane Insogna remained unsolved. Until someone came forward with a shocking confession -- someone who was close enough to the women to escape suspicion. Someone who knew the victims all too well. 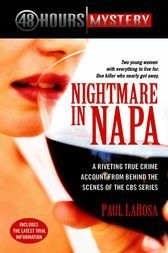 Complete with up-to-the-minute court action and the stunning crime scene breakthroughs that turned the case around, here is the full story of the Nightmare In Napa.